GraphQL is a simple-to-use data query format that allows front-end developers to define exact server responses and aggregate content from multiple sources without the overhead of managing backend systems. Build faster, more responsive mobile apps by making fewer API calls and shrinking data transfers. Use cutting-edge front-end technologies and frameworks to build robust websites. Aggregate your content from multiple sources and deliver it to any touchpoint. Keep your visitors browsing and customers engaged. GraphQL helps reduce the number of API calls and the amount of data transfers, leading to quicker responses, faster interactions and better business results. Help your team avoid context switching: the GraphiQL client allows developers to explore data schema, consult documentation and debug their code — all in the same place. React or Angular? Ruby or Java? Let your developers choose the best language and tools for the job. GraphQL's language-agnostic format enables you to work in the language of your choice without relying on SDKs. Discover a better way to stitch together content and presentation. 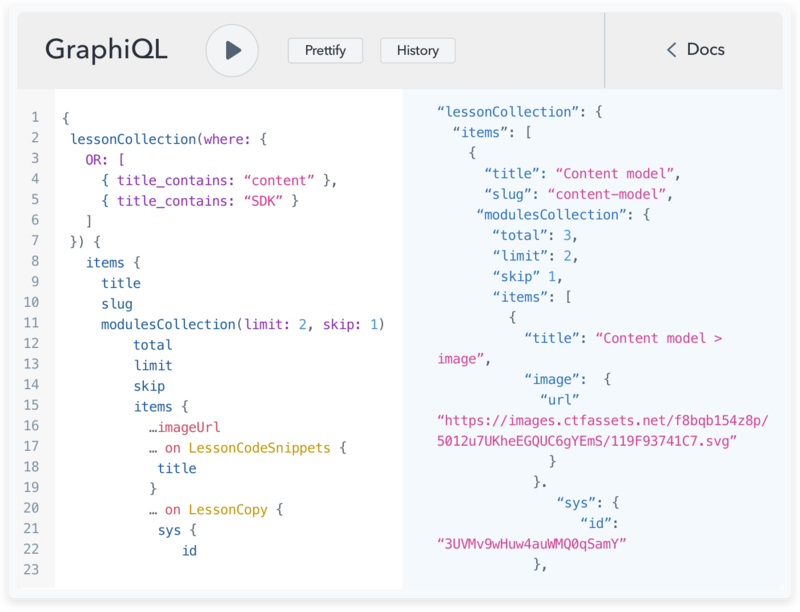 The GraphQL API enables development teams to build flexible preview environments and view published and draft content side by side. Combine deep customer knowledge with unprecedented technical functionality in a matter of days. Schema stitching enables your app to query legacy databases, modern APIs and specialized services through a single API endpoint. Evolving your backend does not have to lead to breaking things. A GraphQL layer enables you to maintain a consistent view of your underlying data, while leaving responsible teams free to evolve and replace individual data sources.